Gutter cleaning is a very important and most often overlooked. 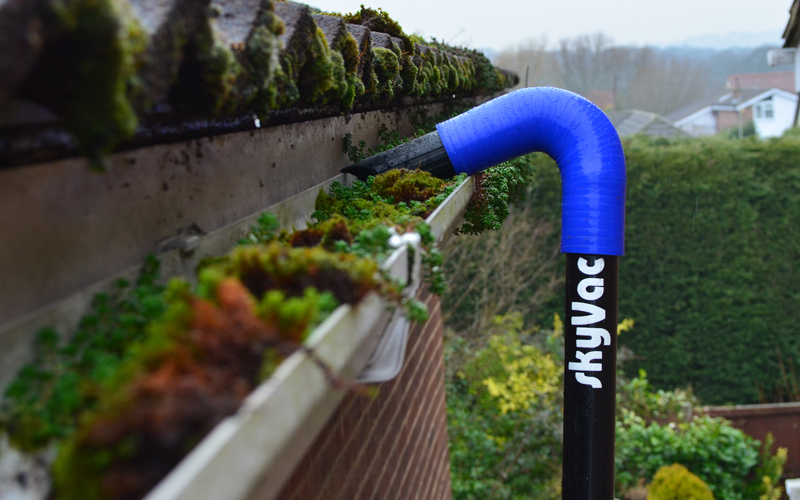 Our high reach gutter vacuum system reaches over conservatories, lean-to's and hard to reach areas cleaning leaves, moss, turf and other debris from guttering/downpipes. We can reach to a height of 50ft without using ladders, expensive scaffolding or high access equipment. We offer a very affordable, cost effective, safer, professional alternative domestic and commercial gutter clearing solution. We use the latest high reach gutter vacuum pole technology with operators working safely from the ground. We are fully compliant with Health & Safety Executive Working at Height regulations. We offer a free gutter inspection before and after each job (if required) using a high resolution gutter-cam system. Live images are relayed down to a hand held device for viewing and recording. Filled gutters can cause damage to your building if water flows over the top. In the worst cases we have seen water cause damage to footings, rotting roof timbers and fascia boards. It can even cause damp inside buildings due to water ingress, not to mention the build up of debris in gutters and the weight of water not flowing away correctly which often warps guttering and breaks gutter clips. This causes the guttering to break away completely from the property. To avoid expensive repair bills, it is very important to have your guttering regularly cleared. Dependant on location, guttering should be cleaned out at least every 12 months to avoid expensive repair bills and at least every 6 months where the property is located by trees and large shrubs. It's recommended that you get your gutters cleaned at least once a year. The best time to do this is at the beginning of winter, after the autumn leaves have fallen and before the really bad weather kicks in. This will reduce your chances of experiencing blocked guttering later on in the year, and gives you plenty of time to book in those vital gutter repairs before it gets too wet and windy. It’s also a good idea to do a quick check of your gutters in spring. Make sure that any large pieces of debris that have blown in over winter are removed, and check that all of the screws are tight and that no brackets are loose. Gutters can be damaged by heavy snow-fall and high winds, so it’s also wise to ensure everything’s in order after a spell of particularly bad weather.